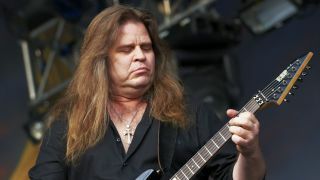 Dio Disciples are currently working on a studio album, Craig Goldy confirms. He tells SleazeRoxx: “We’re negotiating with a record company as we speak. At the moment, the goal is to have an album written and recorded and have it out by the summer of 2017. Dio Disciples recently debuted their Ronnie James Dio hologram onstage at Wacken festival in Germany last month – and they confirmed they’re planning to bring it on tour with them next year. Dio’s widow Wendy said: “We want to create an enduring tribute to Ronnie that gives his music an opportunity to continue touching the lives of new and old generations of fans. Dio Disciples will perform at Everett’s Tony V’s Garage in Washington on October 29.